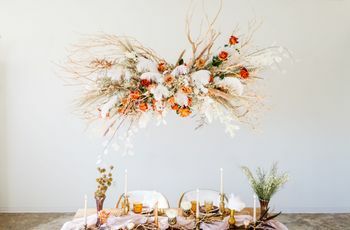 See why these dramatic ideas were made for anyone considering a red wedding theme (and don't worry, we're not talking about that Game of Thrones scene). 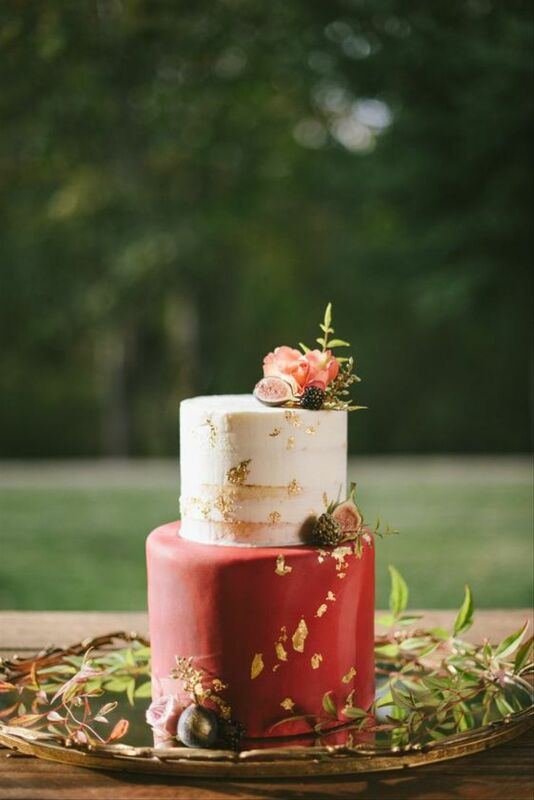 Red is the color of love, passion, and strength, so it's no surprise that it's also a popular choice for wedding color palettes. 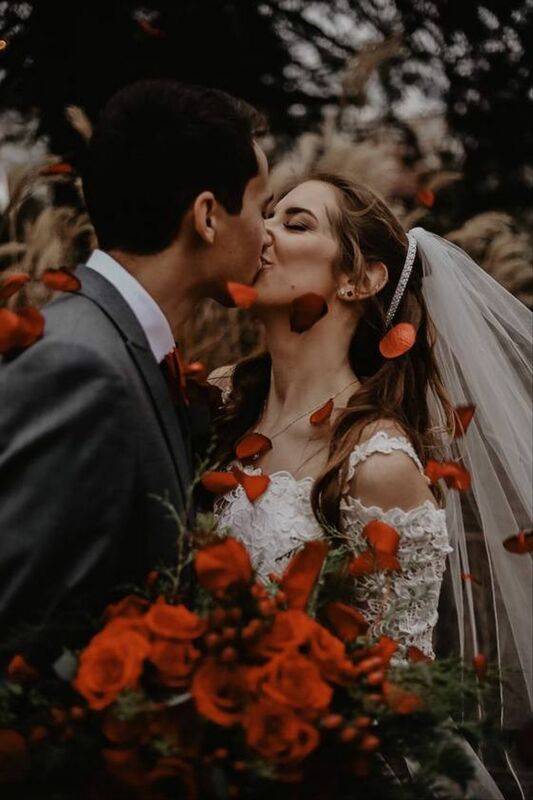 These red wedding theme ideas are perfect for bringing a sense of romance and intensity to your big day, whether your wedding aesthetic is classic, bohemian, or completely unconventional. 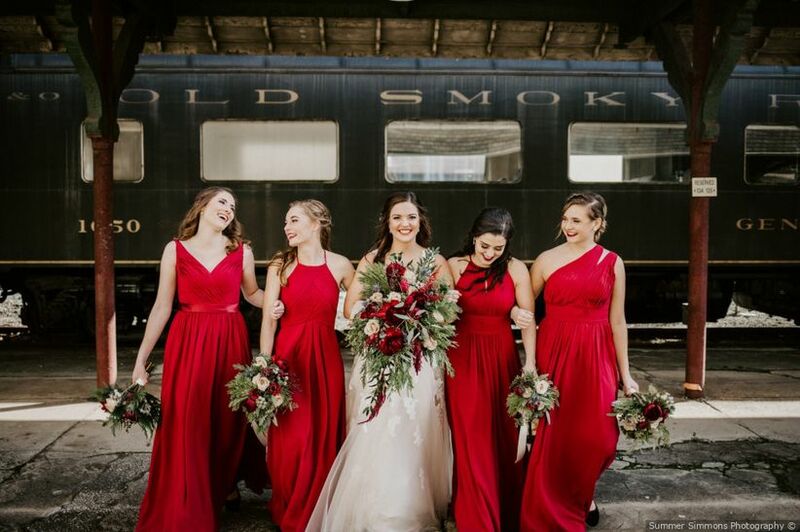 And if you think red is just a winter wedding color, think again! 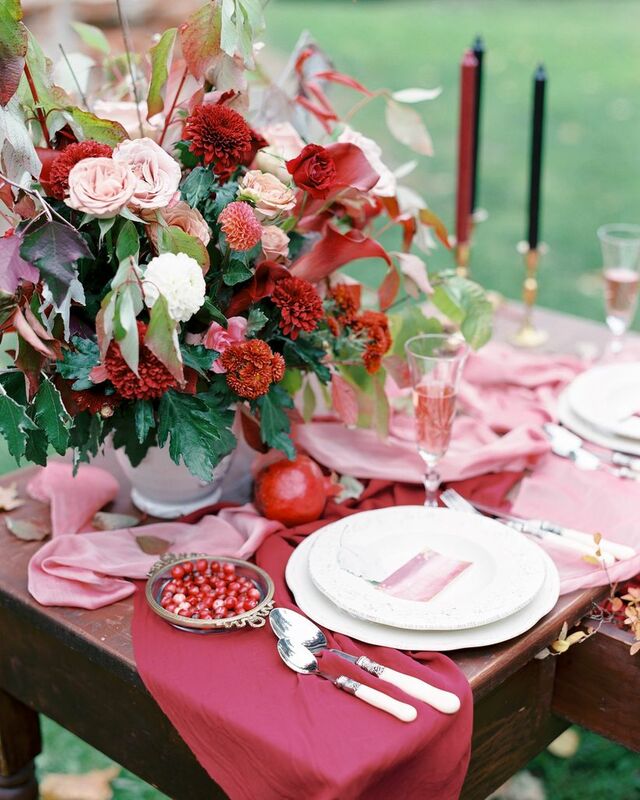 We're sharing our fave red wedding ideas for all seasons to prove that this color goes way beyond your average holiday-themed decor. From classic apple red to moody burgundy and sultry crimson, this fiery color has serious staying power. 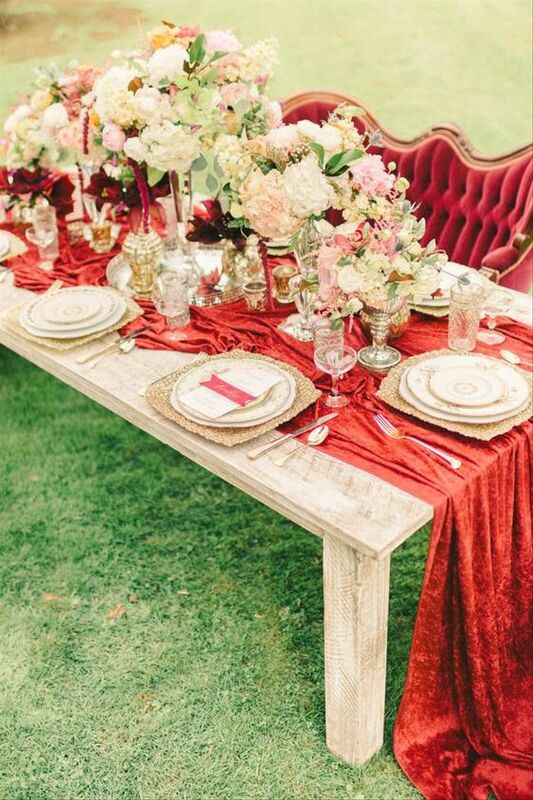 See why we're obsessing over these red wedding theme ideas. 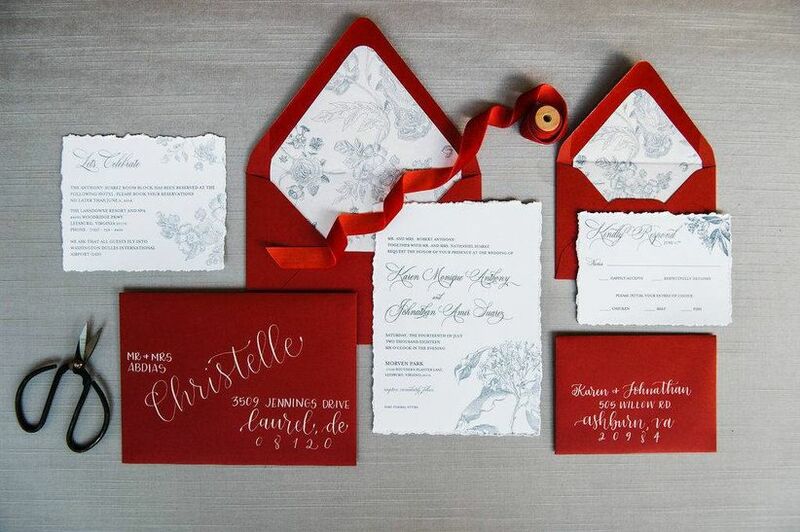 Make a statement from the start by sending red wedding invitations to your guests. 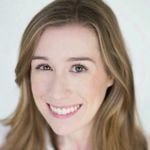 Red invitations are typically associated with the holiday season (no surprise), but they can totally work year-round with the right adjustments. A blue floral motif like the one pictured here is ideal for a summer wedding and gives the invitation suite a patriotic spin. A ruby ring is a luxurious alternative for brides who are open to wearing a non-diamond engagement ring. 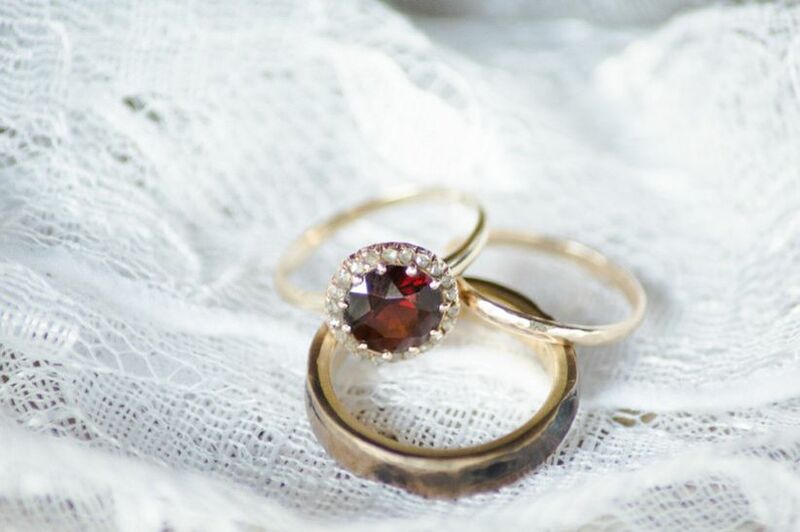 The ruby is the July birthstone, although it's a gorg choice for brides born in any month. Garnet is another red gemstone you could use. 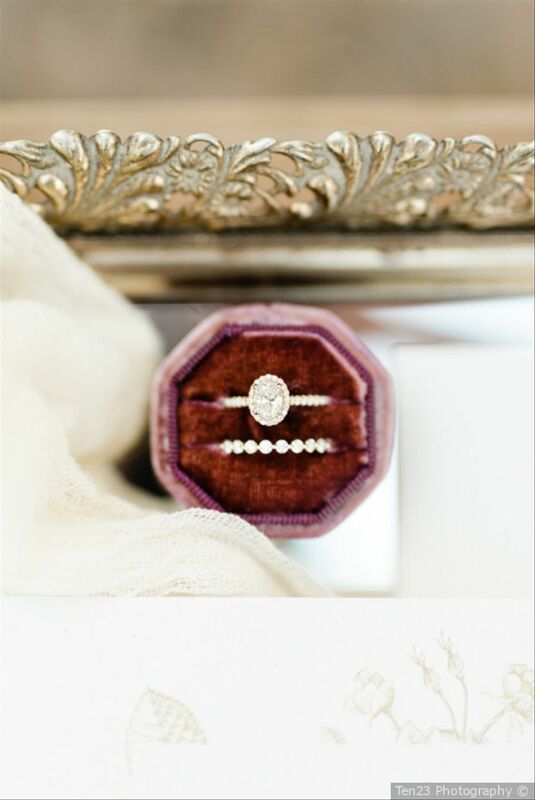 We love velvet ring boxes in all colors, but this red hue is particularly speaking to us. It's a standout choice compared to the pastel and neutral boxes that are much more common. 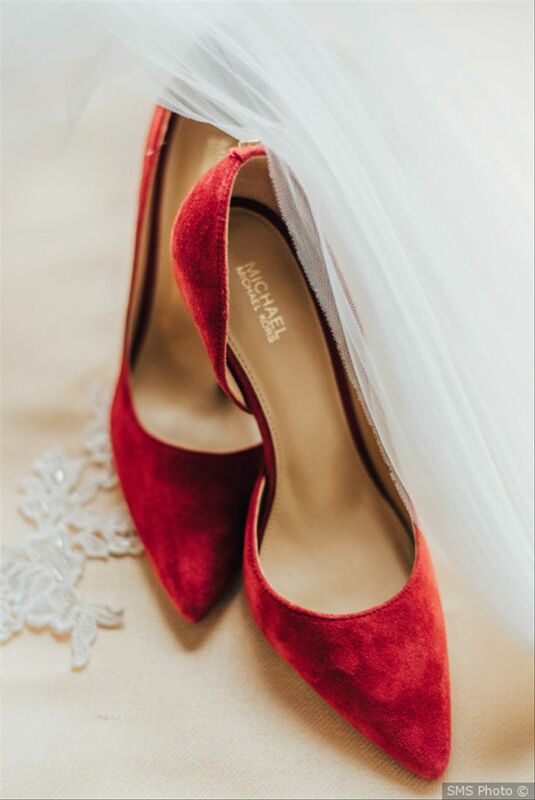 Red high heels are fabulous no matter what, but they're especially fierce on your wedding day. 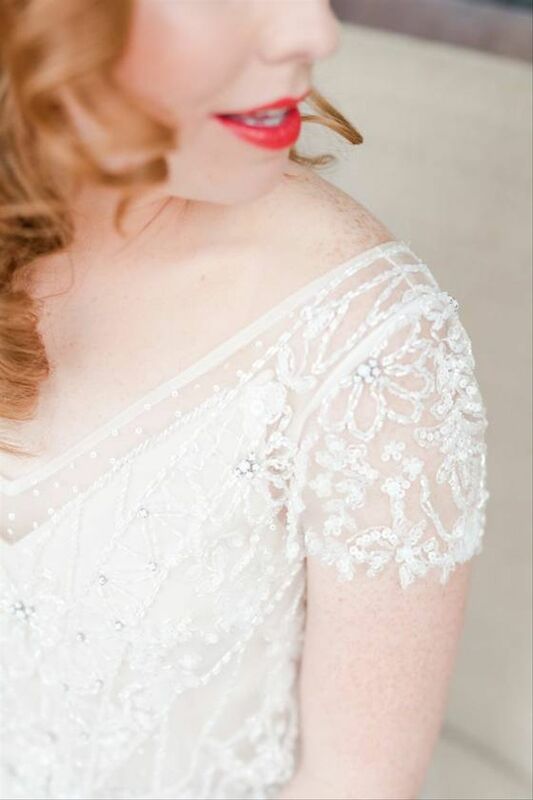 This dramatic option is great for adding some spice to your bridal ensemble (and you can re-wear them after the big day is over!). Floral robes are pretty, but flannel pjs are the epitome of cozy. 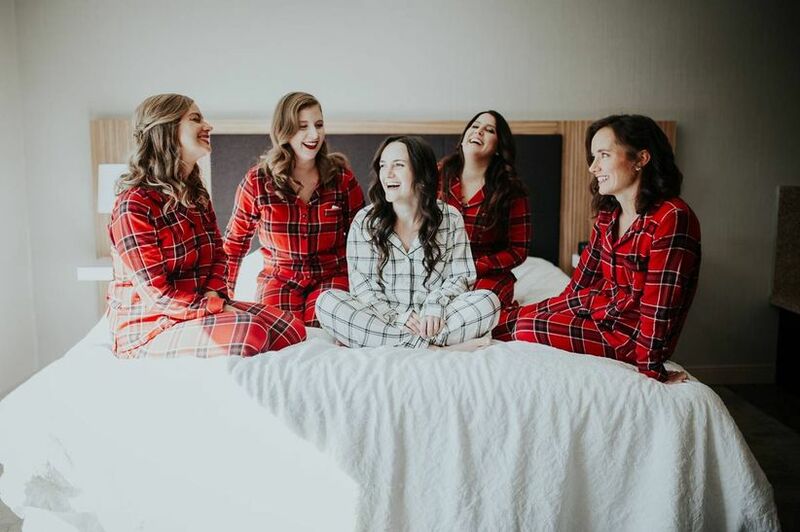 If you're having a fall or winter wedding, get ready with your 'maids in matching red plaid pajamas to recreate this adorable and festive snapshot. Red is a lucky color in many cultures, and it's a very popular choice when it comes to the attire for Indian and Chinese weddings. 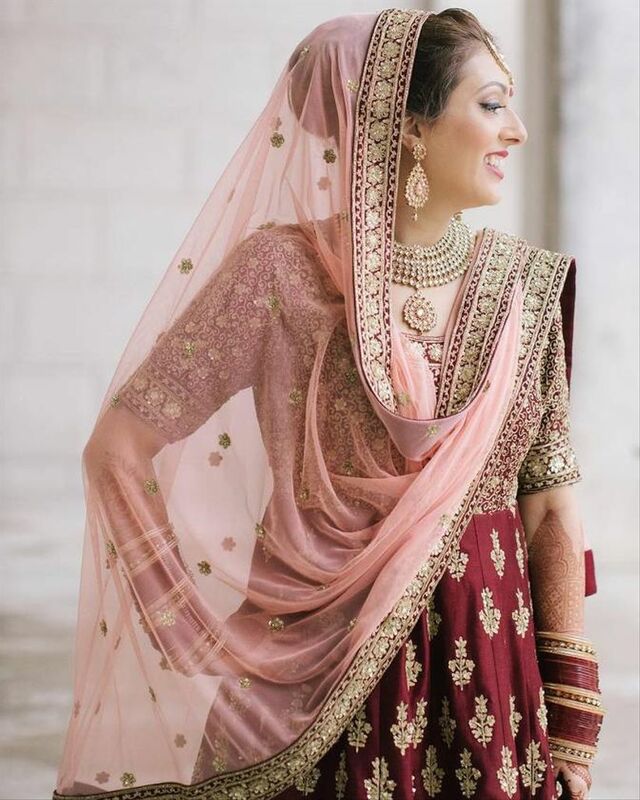 This stunning lehenga is adorned with intricate gold embroidery to complement the pink dupatta and burgundy skirt. One of the easiest ideas to pull off for a red wedding theme? Lipstick! It boosts the simplest of makeup looks and can add drama if you're going for an ultra-glam vibe. A chic red color will never go out of style. 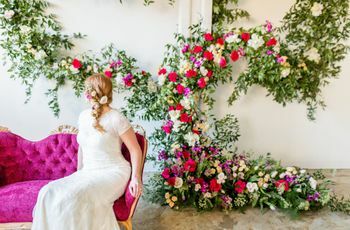 Flowers are one of the best ways to showcase your wedding colors, and luckily, you have a ton of floral options when it comes to a red wedding theme. Some of our favorite red blooms include roses (of course), peonies, dahlias, ranunculus, poppies, anemones, and tulips. 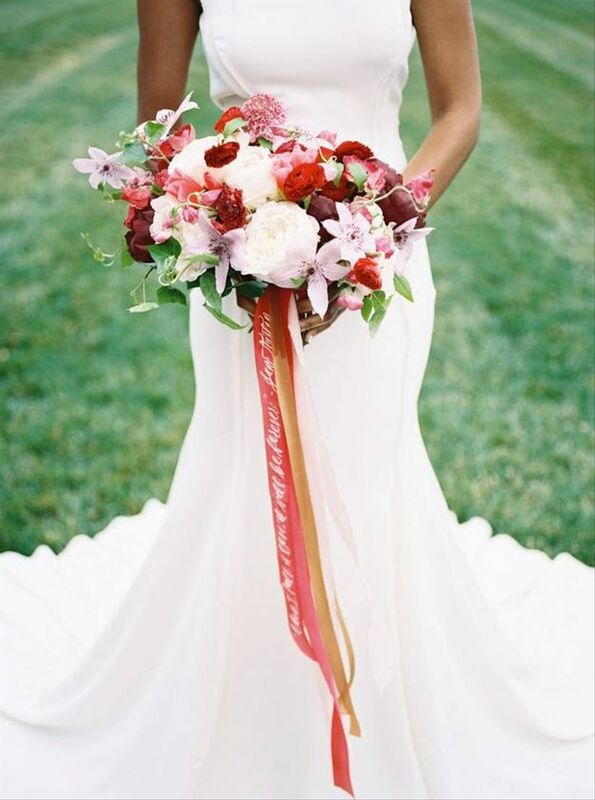 This romantic bouquet features red flowers with pale purple clematis, pink sweet peas, and fluffy white peonies tied together with long ribbons. No neutral bridesmaid dresses here! 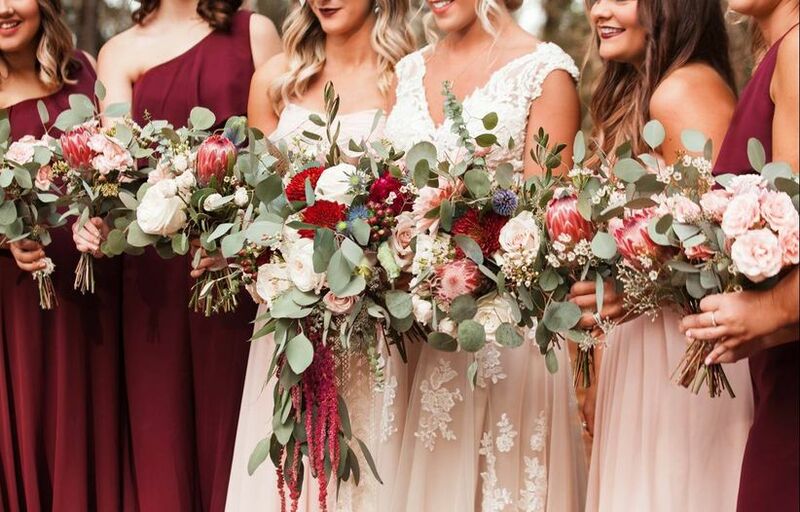 Your gals will make a serious statement by wearing bright red dresses on the big day — we love this idea for a glam winter wedding. If you're doing the mix-and-match trend, stick to one shade of red to avoid going overboard with color. Your bridesmaids can customize their looks by switching up the necklines and silhouettes. 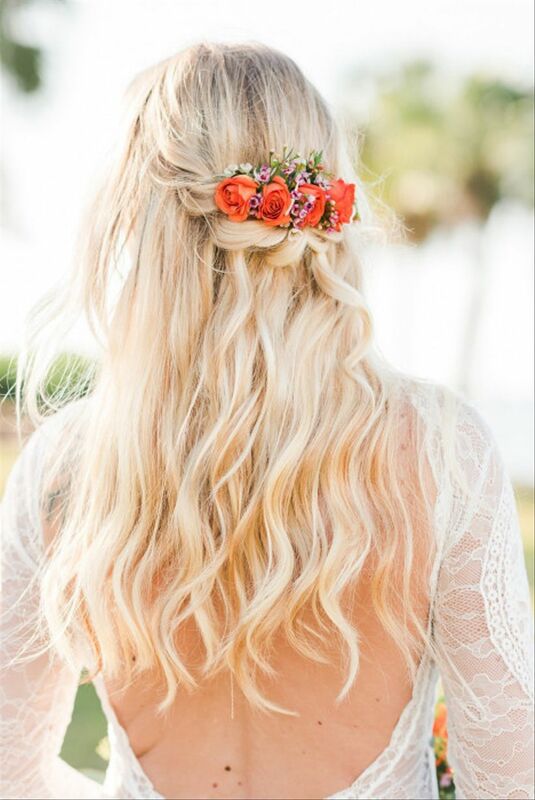 Spruce up your wedding 'do with a few tiny spray roses, which can easily be tucked into a half-up style or chignon. Burgundy is one of the new "It" colors when it comes to groom's trends. 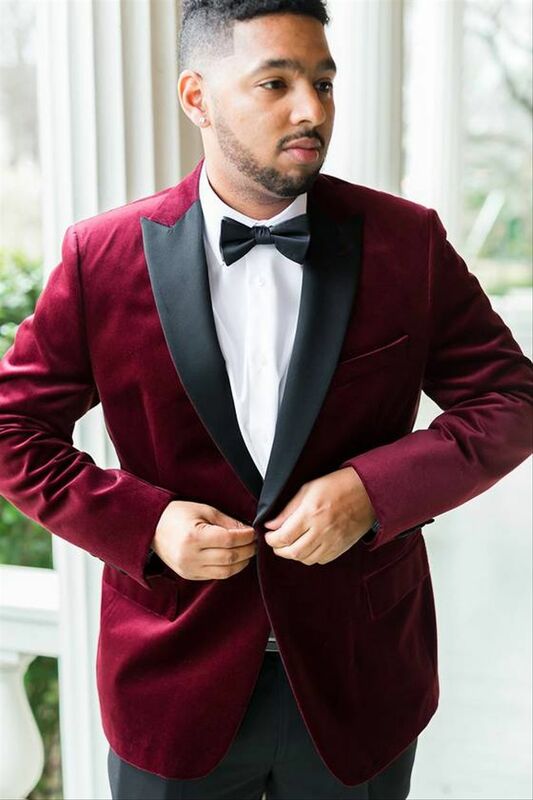 Wear a velvet tuxedo jacket in a crimson hue for an ultra-dapper look, or opt for a dark maroon suit to achieve a vibe that's more casual and hip. Can't commit to a burgundy tux jacket or suit? Rock a colorful tie instead. 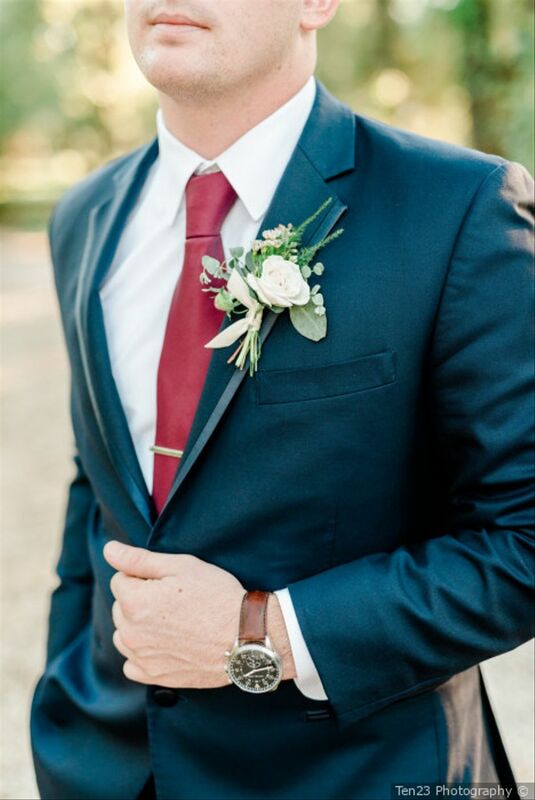 This berry red color pairs great with a traditional navy blue suit. Say hello to your latest cool girl inspiration. 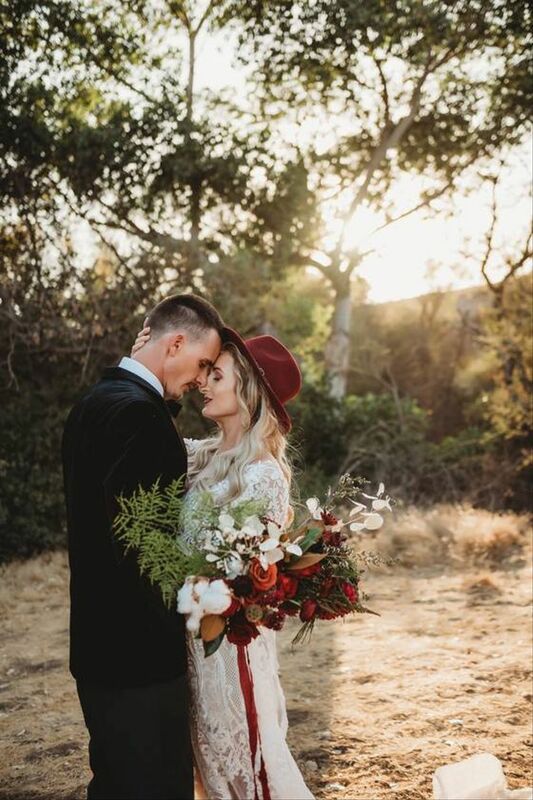 Boho brides can accessorize their wedding dress with a red fedora hat. This unique look was made for the 'gram. 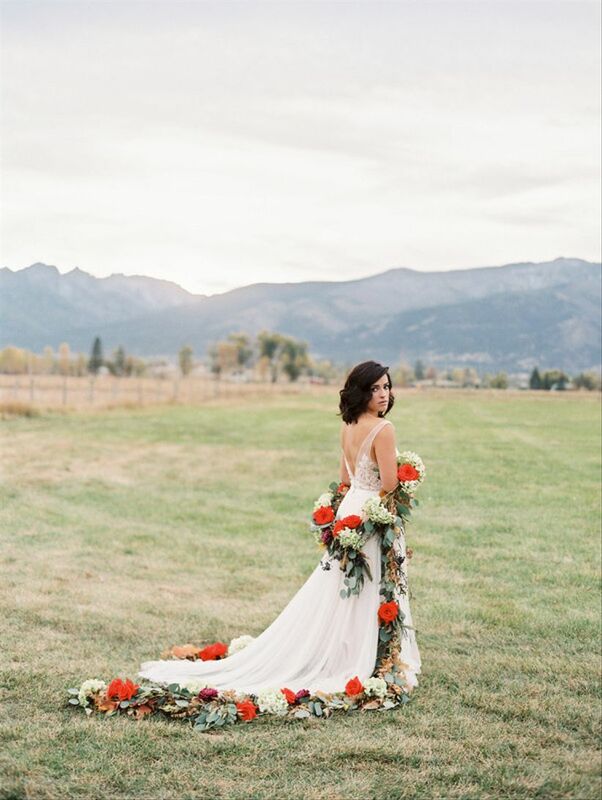 If bridal hats aren't your thing, you can make a statement with a floral garland instead. While we do have to say that this might not be the most practical wedding day accessory, it's a fun prop for bridal portraits, especially if you're going for a high-fashion editorial aesthetic. A more literal take on the red wedding theme is getting married at a venue that's *actually* red. 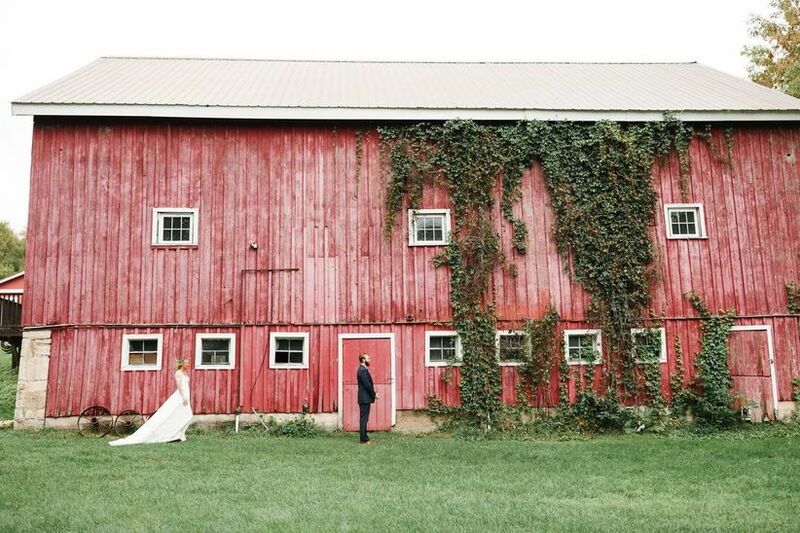 Historic red barns are a perfect example. You can find them all over the country, and they set the scene for a beautiful rustic chic wedding. 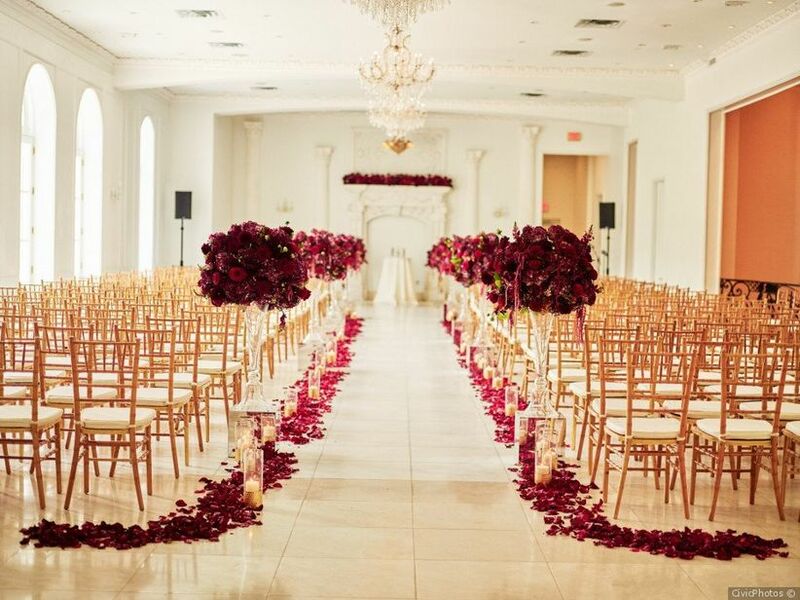 What's more romantic than walking down the aisle lined with red rose petals and candles? Not much. 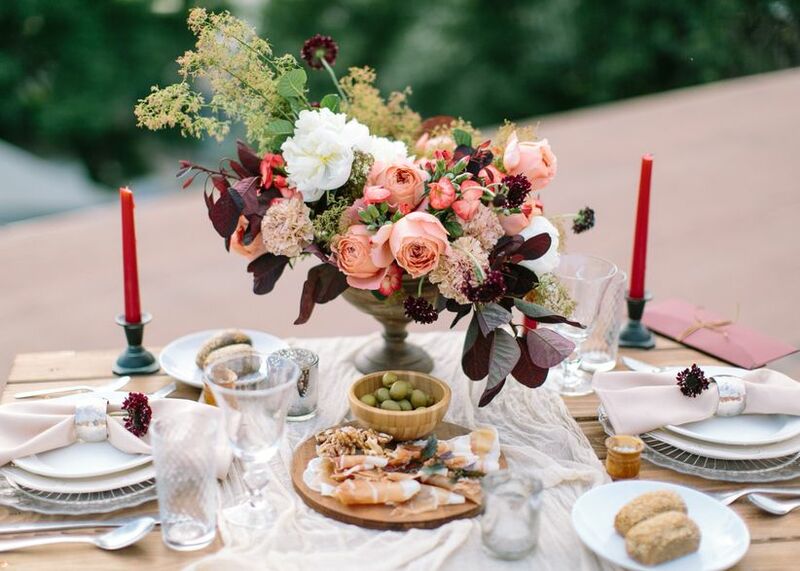 We couldn't imagine a more crush-worthy tablescape for a red wedding theme. 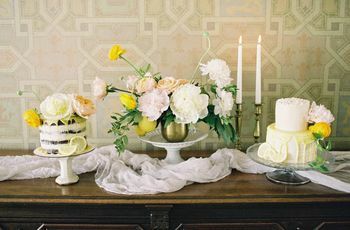 From the velvet runner and gold chargers, to the vintage settee and lush centerpieces, this sweetheart table setup is pure reception goals. Use various flowers in the same hue to create a monochromatic centerpiece that's anything but boring. This oversized arrangement features garden roses, amaranthus, and bougainvillea branches for a classic-meets-cool effect. 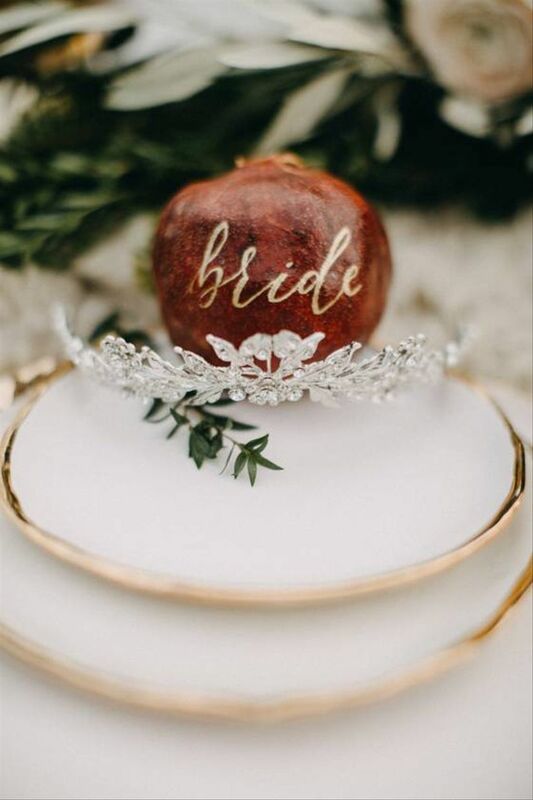 Solid red fruits, such as apples and pomegranates, can double as unique place card ideas for a red wedding theme. Gold calligraphy, seen here, adds an enchanting touch that reminds us of fairytales such as Snow White and the Seven Dwarfs or Beauty and the Beast. 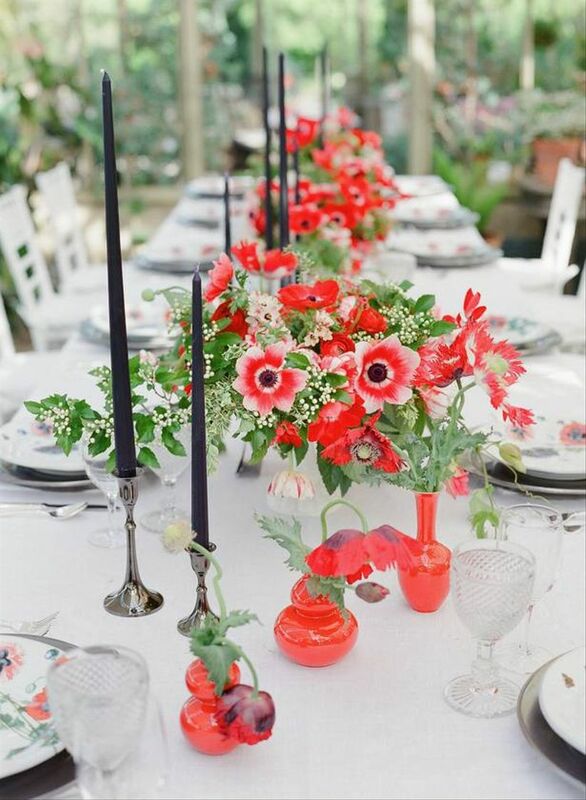 Whimsical anemones are the summer-inspired way to use red flowers for your centerpieces. These flowers grow with long, winding stems, which adds to their playful appearance. Black taper candles emphasize the dark centers of the flowers for a perfectly coordinated palette. If you're searching for a more subtle way to incorporate red into your decor, try colored candles. These red tapers are definitely eye-catching but far from overbearing. Spruce up a pair of antique chairs with heart-adorned throw pillows. 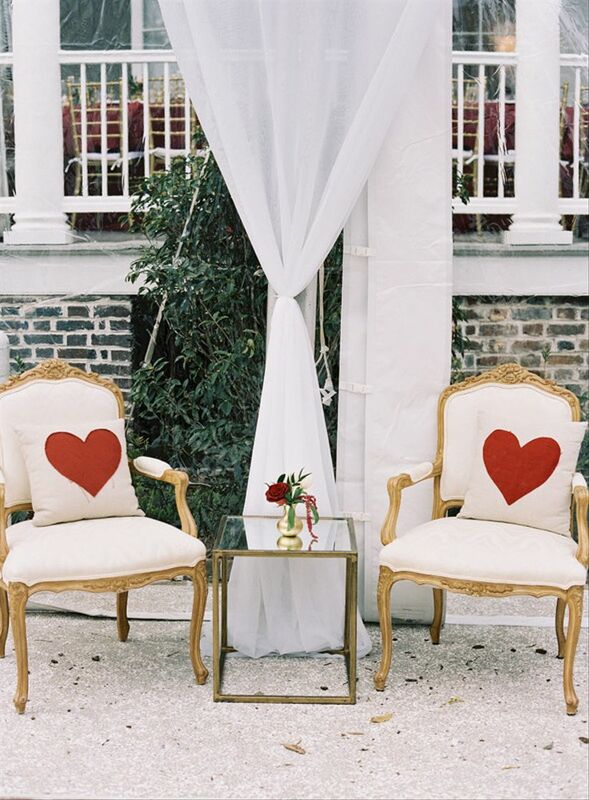 The pop of red is just enough to brighten up this chic wedding lounge area. A red wedding theme is perfect for Valentine's Day nuptials, and so is this drool-worthy tablescape. The combination of pink and red is just too pretty to resist. 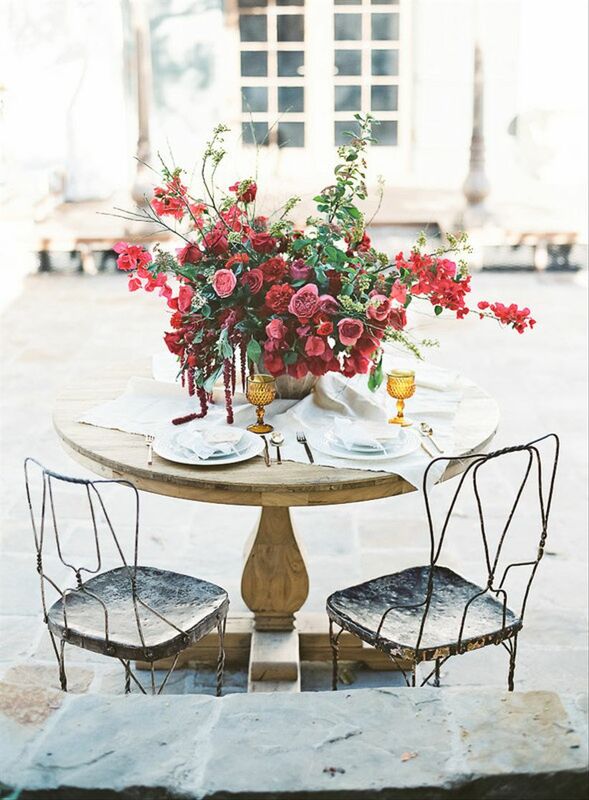 Add gauzy table linens and rose-filled centerpieces to really up the romance factor. Who needs plain bubbly when you can have red champagne garnished with berries? 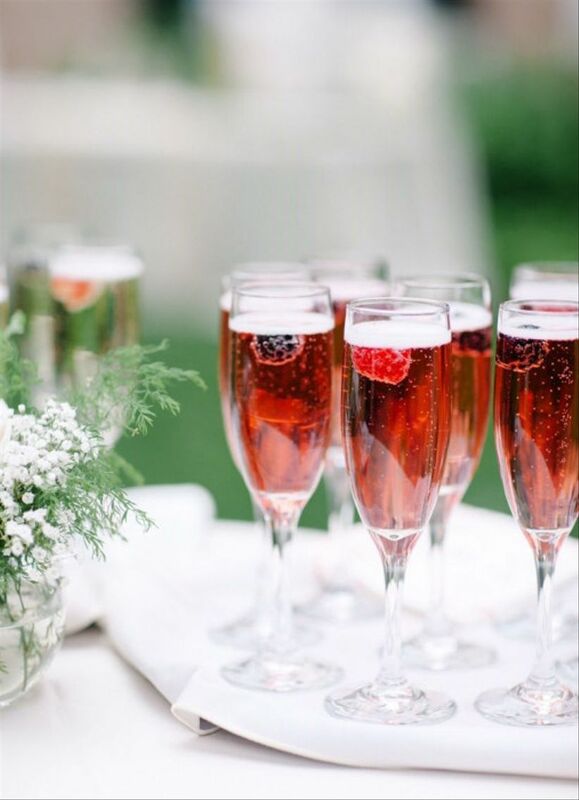 Add a splash of cranberry juice to your fave champagne for a wedding cocktail that's crowd-pleasing and refreshing. We love when couples dare to go bold with their wedding cake. 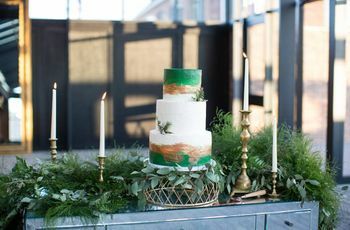 After years of naked cakes and white buttercream confections ruling supreme, colorful wedding cakes are making their way back into fashion. This two-tier cake is a seamless combination of modern and elegant, thanks to the gold foil details and streamlined design. A petal toss is the finishing touch for any red wedding theme. Grab your new spouse and pause for a kiss beneath a shower of rose petals.